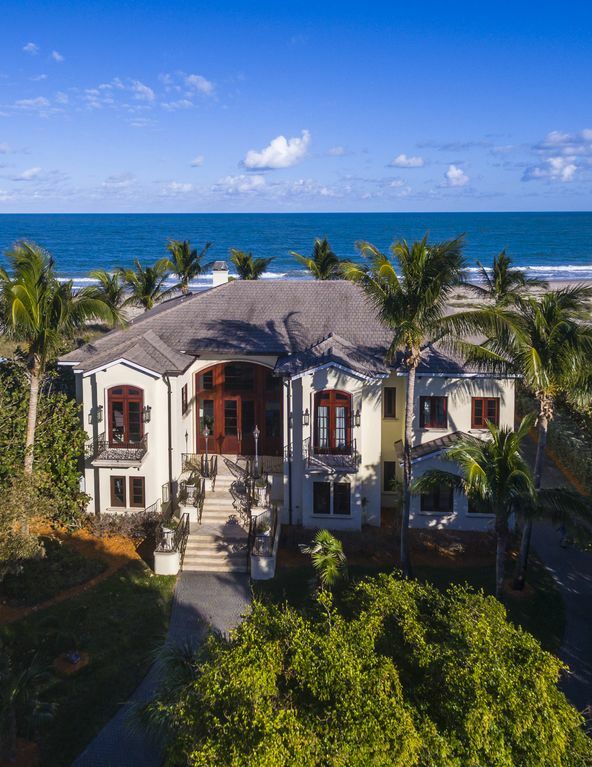 Direct Oceanfront House dans la région de Vero Beach Estate - Taux réduit de 20% à Mai. Cette maison est située directement sur la plage et a vue sur l'océan de presque toutes les chambres, contrairement à d'autres annonces à proximité. L'emplacement est extrêmement privé sur l'une des plages les plus isolées de la Floride. Les portes d'entrée électroniques sont à 300 pieds de la maison et l'allée est entourée par un paysage tropical luxuriant tout au long. Maison offre une vue imprenable sur la plage et l'océan à travers de belles fenêtres et portes en acajou. Maison a été construite avec les meilleurs matériaux et les rendez-vous sans être prétentieux ou voyantes. Immense terrasse avec intimité accessible à partir de cinq portes au deuxième niveau avec cuisine extérieure. Le rez-de-chaussée offre une construction tout à fait unique en sauna et salle de médias bordée de cèdre avec écran rétractable 106 'et son surround donnant sur la piscine. Roomy house with everything you need for a successful vacation on the beach. What a glorious two weeks on Hutchinson Island! Joe’s house is a perfect blend of refined beach casual living. The living room was very comfortable, kitchen is the best of the best, but the panoramic views of the Atlantic were unexpected. The pool was awesome and proximity to the beach, which is a wonderful beach for walking forever. Joe was extremely gracious and helpful. Fell in love with Vero Beach area. The chef and maid service that the owner graciously arranged for us were terrrific. We rented the house for 4 nights including a party of 12 adults and 13 kids !!! We really had a great time over there, house is clean, spacious and very comfortable, all bedrooms are big, restrooms are pretty up to date and all amenities were working nicely. Pool heater works nicely and the beach is just steps away from the house. You don't need to bring bathroom/beach towels, paper towels, garbage bags or plastic cups since Mr Caragol is taking care of all that and you will find them in the house. Lisa, the cleaning lady was very helpful when we got in and when we left the house. Mr Caragol was truly one phone call away for anything we needed (before and during our visit). We would really recommend this property and would like to come back soon. Wow! This house and location are amazing! My wife, 4 kids and I truly enjoyed our stay here. The house is beautiful with an amazing balcony to sit and enjoy the scenary of the beach. The master bedroom was perfect and we were able to see the sunrise from it every morning. The house has everything. This place was memorable and I look forward to going back with my family. Thank you Joseph for offering your house. Amazing truly Amazing. We are a family of 10 (3 generations, ages 13-78) and we all completely enjoyed this spectacular house. The house itself was gorgeous, the pool and hot tub were great and the beach was pristine. The beach views through the picture windows were incredible. Joe the owner was very helpful, he met us on arrival, showed us the house and offered to come help us during our stay (we didn't end up needing him). Thanks so much for a great vacation. Our family reunion was so special and this home really allowed us the time and environment to celebrate and enjoy!